For our Heritage Lottery Funded project, You Are Hear: sound and a sense of place, we commissioned Sound Recordist Stuart Bowditch to capture what Essex sounds like in the present-day. Some of his recordings were made in response to historic recordings of events and places from our Archive, some in response to public suggestions about which sounds represent Essex, and some on a whim and a fancy. The recordings have been posted on our online audio map of Essex Sounds, where you can compare past and present recordings made across the county. They have also been deposited with the Essex Sound and Video Archive, so future generations can experience the sounds we hear today. What will Essex sound like in fifty years? You can read about Stuart’s week-long trip to the north of the county in an earlier blog entry. Here, he reflects on the project as a whole. All images used with Stuart’s kind permission. So, the recording phase of the You Are Hear project comes to a close, and I will miss it. It has been a year full of exploration and discovery, meeting a multitude of characters and learning about local skills and traditions, none of which was further than 42 miles (as the crow flies) away from where I live. I have travelled from the more familiar industrial and suburban south to the rural wilds of the north, and from the summery seaside riviera of the east to the west that seems somehow slightly detached and belonging to neighbouring counties. We knew from the outset that the project would only be fruitful if we listened to local people, their suggestions and invaluable local knowledge. But we also knew that the ‘picture’ of Essex that could be formed from its diverse sounds would be more vivid and much wider than the stereotypical image that is often perceived. We carried out public surveys in several towns and reached out using mailing lists and social media, asking: What does Essex sound like? What sounds are connected to the place where you live? What is a sound of today or yesteryear? What sounds are new or have been lost? Questions certainly got people thinking, and we were bombarded with suggestions, clues, hints and leads to where, when and how we could find them. It was my job to take this valuable information and to try and capture the sounds for preservation in the archive; to paint that ‘picture’ of Essex as best as I could. I drove (a 15 year-old Corsa), jumped on trains (including a Class 156 and Class 31), climbed, hiked and walked to all kinds of destinations, at all times of day and night, in all kinds of weather and every season throughout the year. I discovered new places and villages that I’d never heard of, as well as revisiting places I’m familiar with to hear them in a new ‘light’. Wherever I went, I went with an open mind, not jumping to any conclusions before arriving in order for me to capture as authentic a recording as possible. Apart from setting out with a small nugget of information, who was I to know what a place would actually sound like on any given day? There are so many variables that it’s really not helpful to try and imagine them on the way there. Upon arriving, discretion, sensitivity and impartiality were often paramount to capturing the right moment, negotiating permission or gaining access to property. Maersk Lins being loaded at DP world, London Gateway. Listen to the sounds on the Essex Sounds page. Working for the Essex Record Office helped to reassure people that my intentions were honourable,and that recording the sound of their activity, place of work or garden was of value, even though at first they may have thought the idea strange. It also afforded me some leverage in gaining access I wouldn’t usually be able to negotiate by myself, such as on the quayside of the DP World super port and the factory and farms of Wilkin and Sons Ltd.
I’ve also had to do things I never had before in order to gain access to places, such as sign disclaimers and send a scan of my passport through a week in advance to gain access to a restricted area. In fact I’ve gone to quite some lengths in the pursuit of capturing sounds: I even put my recording kit through an X-ray machine to record, amongst other things, the men who are responsible for luggage ending up in Barbados when it should have been in Lanzarote. As well as contributing to a more detailed and colourful image of Essex and its inhabitants, I have also learned a lot during this project. People are generous with their time, knowledge, good will, and sometimes even gifts. Some people’s skills and knowledge are very niche, which is interesting, informative and essential, both in their given field and in their ability to find somewhere within society where they excel. Others were reluctantly compliant when asked by their boss to start up a particular machine so that I could record it, but reassured after a chat about the reason for my interrupting their work routine. There is a reasonably high level of trust between folk, which worked in both directions: someone letting a stranger into their house to record the aeroplanes, and me meeting a man outside the chip shop in Jaywick at 10pm with my sound recording equipment. Both situations were problem free, naturally, and led to good recordings and unique experiences for all parties. 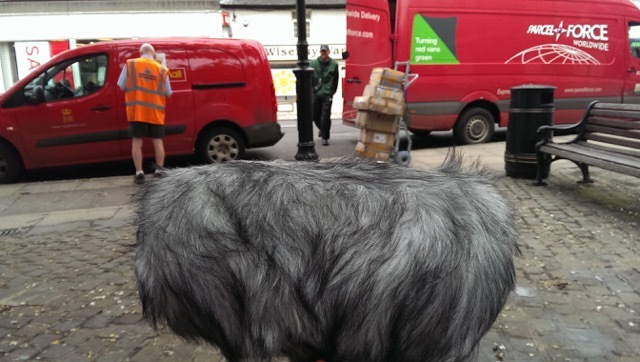 I discovered that a big, fluffy microphone windshield apparently resembles a cute, fluffy animal, and some members of the public seemed surprised when they discovered that its owner wasn’t so. I mean, you wouldn’t put your finger onto a photographer’s lens and expect them to be happy about it, would you? But being so visible also worked the other way, as I was able stand in the middle of two hundred people drinking champagne and eating canapes for 40 minutes whilst appearing to be invisible. The microphone recording soundscapes on Halstead High Street. Did you see the microphone on our Twitter feed? It gained its own followers as it travelled round the county in search of the best sounds. My work didn’t finish with recording. Most of the recordings were edited and uploaded to the Essex Sounds website, where you can explore the map and listen to sounds relating to that place. As part of the project, we’ve also been digitising a lot of the archived recordings, and you can hear recordings we’ve made as a comparison to archival recordings. One such location is Chelmsford Cattle Market, where you can hear what the market sounded like in the 1950s or what the site sounded like in 2016 (now the indoor High Chelmer shopping centre). You can also hear Colchester United winning a 1971 match at their Layer Road stadium, but losing in 2016 at Weston Homes Community Stadium (oh dear). We also reached out to the general public to contribute, and many people have uploaded their own recordings to further widen the view of where we live. If you have something that you would like to contribute, please head over to the website and get clicking. Or if you’d prefer just to hear what we have all been collecting, the map is where it’s at. I hope you enjoy it. Is there a sound of Essex that we have missed from our map? We continue to welcome public contributions of sound recordings to our Essex Sounds map. Read more about how to contribute, then get recording! 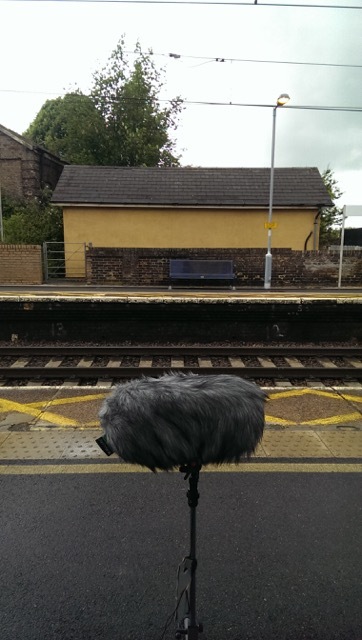 For the Heritage Lottery Funded project, You Are Hear: sound and a sense of place, we commissioned a Sound Recordist, Stuart Bowditch, to capture some of the sounds of Essex in 2015/2016. 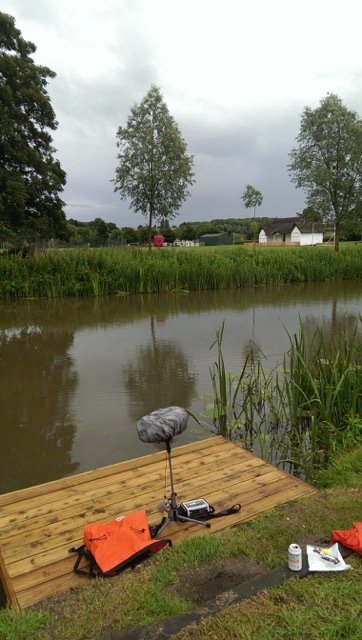 We compiled suggestions from members of the public, gathered at survey events held last year, of typically Essex sounds that should be recorded. We also had some specific items in mind to compare with historic sounds already in the Essex Sound and Video Archive. Stuart has busily been recording here, there, and everywhere to get a wide range of recordings. They will be deposited with the archive, so future generations can hear what Essex sounded like in 2015-2016. Clips are also being pinned to our online audio map of Essex Sounds. There, you can compare the sounds of today with sounds of similar places or events from days gone by (click on the ‘old and new’ option at the top of the page). At the end of June, Stuart went on a week-long recording trip to the north of the county. Here are some of his thoughts after day one of his trip. After packing my bags and picking up some kit from the studio I set off for the wilds of north Essex, happy to be leaving the south behind. Farewell to the estuary, to the busy Victorian terraces and crowded roads with a particular style of driving. It felt good to wave goodbye. And then say hello to a long queue on the A130. But despite that, I made it to the Essex Record Office to pick up some project flyers before heading to my first port of call, Marks Tey. Not exactly north, but the gateway to the Gainsborough Line, which takes you due north to Sudbury, via Chappell and Bures. I’d sought permission to record from Abellio Greater Anglia but hadn’t heard back, so I asked at the station when I arrived. My slightly unusual request was met with some surprise and puzzlement, but after a couple of phone calls the station manager gave me permission, and I set off with my instructions not to stand next to the edge of the track. So I recorded a few trains passing through the station (a class 360 to Ipswich stopping and departing, a class 90 Intercity to Liverpool Street, a class 66 freight train to Felixstowe port and another class 360 to Liverpool Street) and waited for the Sudbury train to arrive. The driver and guard seemed okay to have me on board, and I duly recorded the whole journey through Chappel & Wakes Colne and Bures to Sudbury. I wasn’t sure if it was just the way of things, but there were no announcements or tickets checked during the entire journey, which would have made the listening experience of recording a little bit more informative. On the return journey, however, an announcement was made about the ticket machine not working, which was a shame to miss as it added some personality to the soundscape. 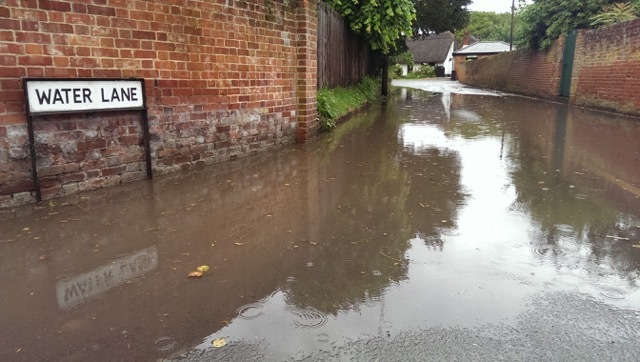 luckily I found it next to a huge puddle in Water Lane. I bought a sandwich from the local delicatessen and found a very nice spot next to the River Stour from which to eat it and also to record. It was slightly raining, but that did nothing to deter the house martins, ducks and ducklings, and occasional passersby from enjoying the peaceful moment. Back in Marks Tey, I loaded up the car and drove west, through Coggeshall to see if my friend Walt was in. He wasn’t. That’s a shame as he said it’s particularly quiet standing in his garden and had invited me over to record one day. I had to leave that for another time. So I proceeded further along the A120 and saw a sign for Stisted. My friend Ed had said it was a particularly beautiful village, so I decided to take a detour. The buildings are great, so I decided to park up at the Village Green. As I did so the school bell was chiming, but unfortunately it had stopped by the time I had set up the microphone. I waited for half an hour there, but the bell never chimed again. However, I did get a great recording of the birds on the green which included chaffinch, greenfinch, robin and blackbird. 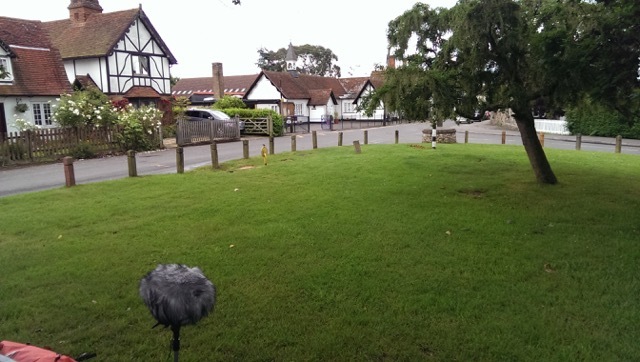 There was also a reasonably continuous stream of cars making turns at the junction, but when they weren’t present the quietness was really pronounced and the recording will clearly indicate the impact that motor vehicles have on the sonic environment. I may return tomorrow if I’m in that area to try and record the school bell. Next on the list was Halstead High Street, and I decided to make two recordings here, one at the bottom of the hill and one at the top. There was a constant flow of traffic along the high street, including many vans and heavy goods vehicles. There were also plenty of passersby going about their daily business, including people of all ages and social standings. One of the interesting things about this project is picking up the different accents and languages that can be heard in different parts of Essex today, and coming from the south of the county it was interesting to note that in an hour on Halstead high street I didn’t hear a single foreign language. The recording at the bottom of the hill features two van drivers loading parcels and letters from the Post Office and some children playing. The recording at the top of hill was made next to the war memorial as light rain was falling, and also captured the moment that St. Andrew’s Church struck 5 o’clock. The first day of recording had felt reasonably productive, and despite the promise of some traditionally British inclement weather the next day I was looking forward to more roaming and recording. All of Stuart’s recordings from his trip up north are collected here on the Essex Sounds website. You can follow Stuart’s progress with his latest recordings on his Twitter account: @stuartbowditch. To hear more about Stuart’s adventures, plus talks from the rest of the project team and guest speaker Martin Newell, come to our official Essex Sounds launch. The event will be held at Colchester Town Hall on Wednesday 28 September 2016, from 6:00pm to 9:00pm. Attendance is free, but please register on our Eventbrite page.